The word alone conjures up negative imagery. Maybe the image of physical waste comes to your mind - garbage, trash, refuse, the stuff we don’t want near us. Or maybe you think of wasted effort and the things you spent so much energy on that resulted in nothing. You have probably experienced the frustration of time spent on fruitless ventures. It’s all bad. It’s no surprise there is an entire part of the US government dedicated to fraud, waste, and abuse of government resources. In spite of that, the mythical story of the $700 toilet seat, and Vegas conventions where government employees wasted away millions of taxpayer dollars drive the citizenry crazy. When waste hits closer to home, the reaction is usually more emotional and personal. As a business owner, you hate to think of your hard earned money getting lost. As a manager or employee, seeing waste affect your salary and everyone around you can destroy morale. You've seen time wasted on software that doesn't work, people who don't put in the effort, and meetings upon meetings discussing the same issues over and over again. But how do we prevent waste from infecting our businesses? I want to share a few key strategies that we and our clients use to minimize waste. If you take the time to implement these, I can guarantee that it will reduce waste. Everyone follows process. No matter what someone does, if it’s part of that person's regular schedule, he or she has come up with a method that they like. The question is whether or not that process results in efficiency. The only way to determine efficiency is by exploring the different tactics and strategies available. Have your managers sit down with their reports and ask them what they do on a regular basis. Then, have them put on their creativity hats and figure out if there are ways to do things better. Maybe someone could save time if they had access to a particular resource. Maybe there are bottlenecks in the way things are done that you didn’t know existed. After the discussions, have the employees write down those processes, with their managers reviewing them so everything is clear and in black and white. Documenting process can be a simple flow chart, or a numbered list of tasks to be done. The final step in this method of reducing waste is actually the beginning of the next step - figuring out how to use software to enforce the process. All the documentation in the world doesn’t mean anything if no one uses it. Use your CRM to set up workflows and assign tasks to people based on defined triggers. As a GreenRope client, you have access to experienced and knowledgeable team members who can help you. They can translate your written documentation to functioning workflows within GreenRope, helping you define and enforce process. Do your employees get complacent, first learning how to do their jobs, and then not taking the time to improve their knowledge and skills? Lack of continual education leads to people becoming stagnant, not caring about their own personal growth, which means competing companies can (and most likely will) start producing superior work. Stagnation stifles creativity and innovation. The best way to beat a sense of personal stagnation from your team is to encourage them to learn. Are they reading papers on how to do their jobs better? Are they attending conferences? Are they attending webinars? If the answer is no, you have people who are losing ground to your competitors. A while ago, I talked to a friend of mine who was having trouble with his employees adopting the CRM he had installed for his sales team. They did not want to be held accountable. They wanted to keep doing business they always had, driving around and meeting leads and clients in person. Long lunches, golf days, and happy hours were part of how business gets done. A CRM was just a distraction. The struggle to get the CRM used on a daily basis required a massive cultural shift in the sales team’s mentality. But he sold them on the value that GreenRope could provide by giving the sales team access to email marketing and website analytics data. Slowly, as the sales team began to use the CRM more, the number of boondoggle events decreased. It became very clear who the real producers were, and as the spin artists left the company, sales increased. With more training, the salespeople learned to use their CRM, and the marketing team set up marketing automation (drip campaigns, workflows, etc.). Sales went up while waste went down. It takes leadership to increase sales and reduce expenses. The management of the company took the education of their team seriously and required dedication to it. If you allow your team to use excuses to avoid accountability, you open yourself up to more waste. Put simply, if someone doesn’t take the time for learning and self-improvement, they are on a track to waste more of your resources. Education cuts waste, so make it a part of your culture. Here at GreenRope, we have a lot of ways that we reach out to our customers to help them. We have e-books, whitepapers, case studies, and videos. Every month, we send an email newsletter outlining new features, industry trends, and blogs we have written. Our knowledge base is extensive and searchable. Our client services team hosts two webinars every week - one an open Q&A webinar, and another focused on a specific part of the platform. Support is available 24/7 via email, and nearly that via chat or phone. We are here to help our clients every step of the way. As part of every new GreenRope account, we also provide 3 or 4 hours of dedicated onboarding and training. We provide creative services, such as website design, email template design, workflow design, analytics, strategy, and more. At no point should any GreenRope customer feel they can't reach out for help, and that is an important feeling we convey to each and every client. Every now and then, an email comes through where someone says “I’m looking for another software platform that can do x”. 99% of the time, we have had that built into GreenRope for months, if not years, but the user didn’t take the time to look for it, or ask anyone at support. How does this ever happen? There are reasons why some people choose not to master the software they have available to them. Sometimes it’s because it’s easier to blame software for the lack of productivity. Sometimes it’s because they feel like their daily responsibilities keep them too busy to spend time learning. Sometimes they just want to do their jobs and don’t care about self-improvement. Whatever the reason, if you allow your team to be complacent, to ignore how to get the most out of the software they are using, you are encouraging a culture of waste. Require your team to spend a certain amount of time every month on self-improvement, and encourage more. Ask them to leverage resources that are there for the taking (e.g., free online classes, vendor-provided training). Give them freedom to choose what their path looks like, but engage their desire for self-improvement, and they will naturally bring that to their work life. One of our newer clients was in the midst of determining the best way forward. On one hand, the company could use a more traditional CRM, with a system integrator and all the developers required to tie all their software components together. Or they could use GreenRope. The other bid would have taken over 2 years to implement and cost the company over $200,000. 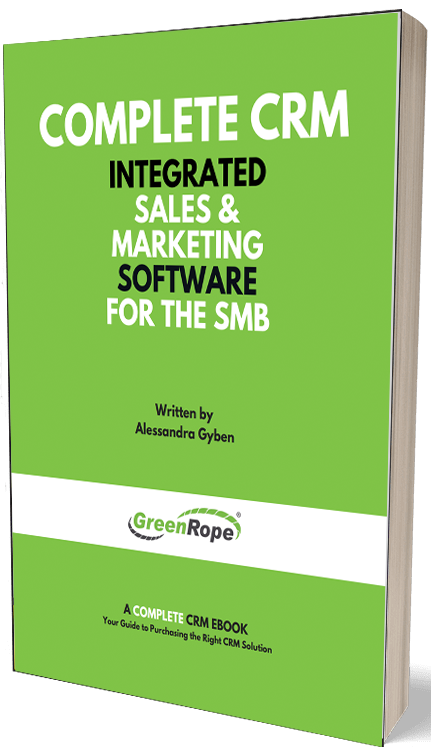 The GreenRope team was able to complete the entire integration and staff training in under 2 months, and for less than 10% of that cost. The proof is in the pudding - if you want to cut waste, use vendors and software that get you there. It’s a famous expression, but it holds true throughout life. If your company culture is one of working efficiently, without frustration, and with continual learning, everyone wins. Take the time to be the example, to lead your team, no matter what level you are in your company. Demonstrate self-improvement and stretch your abilities and knowledge. It will change everything around you.